Originally hailing from England, Australia has been Tarsha’s home for the last 34 years. A creative and adventurer at heart, Tarsha has studied and worked in Sydney, Auckland, Florence, London and Istanbul and travelled to many eye opening countries, especially the poorer ones whose deep roots in creativity and culture captivate her. Tarsha’s initial trades are as a textile designer in the soft furnishing industry, producing for leading textile houses, and as a public relations consultant working on various large national campaigns within the environmental and art sectors. Frequently career restless yet knowing deep within her core that she needed to make her own mark on the world, Tarsha transited through various marketing fields that included civil engineering, skin care development, film production and disability empowerment. Tarsha now focus’ her time on projects that have a unique edge and heart, a call to being part of meaningful change in the world, combined with high octane and positive energy. All of her experiences (and after a 20+ year designing hiatus) have led to the development of her own 100% ethical bed linen brand – Organic Bed Threads – made via certified organic cotton, fair trade standards. 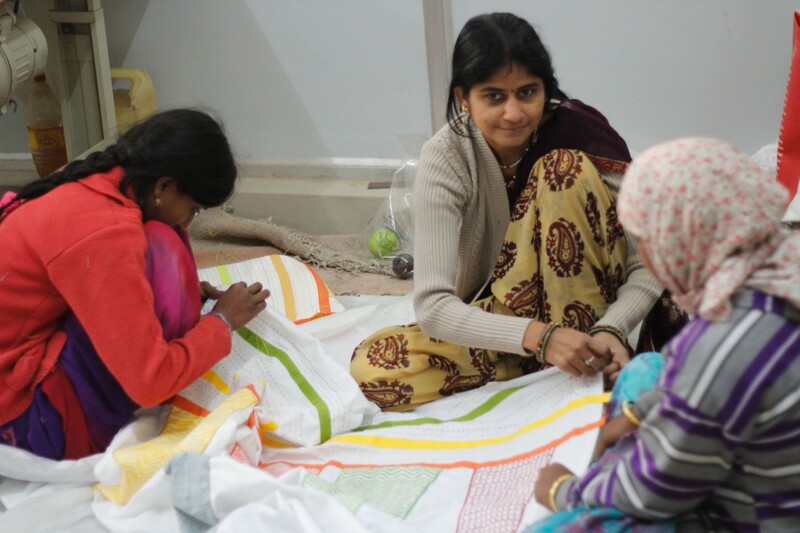 It represents a revival of traditional artisan techniques & women’s group empowerment, all with a purpose to assist a developing country, India. You can read more here. I have always wanted to help make positive change at a grander scale but never wanted to just give handouts. Knowing that up to 35+ people are gainfully employed from this project is truly a humbling thought. My idea is to design, produce and educate people about the necessary value of buying ethical products over generic, standard and often low quality products. Creating Organic Bed Threads is a 20 year shelved dream that has come into fruition in very unusual and delightful ways. 20 years ago my original bed linen brand was purely to create doona/duvet covers with no significant ethical value. After many interesting career and travel twists and turns, a unique 100% ethical value has been added to my bed linen eBusiness of which I am immensely proud of, despite the hard slog that has accompanied my research, development and production phases while working with developing world manufacturers and artisans. I remain determined to create quality ben linen products that benefit the producers and artisans and the end user at all levels, and not least to say the significant health benefits for all. I take great respect in providing consumers with unique and versatile designs that have greater meaning to all! I am passionate about uniting my innovative, visionary and humanitarian ideas that help people at a global scale. Focusing my time on projects that have a unique edge and heart…a call to being part of meaningful change in the world…combined with high octane and positive energy are what invigorates me. I have deliberately set my company some steep international social responsibility standards to adhere to, along with rigid company standards to comply with, so that consumers are aware of my business transparency. The primary way my business will make money is to sell online via my own eCommerce site, to international markets that have the same bed linen sizes. Beyond the start-up phase of steep financial outlays, I will also focus on social media sale interaction and partner with other artisan and home wares eCommerce sites to sell my unique product line. As I type this my bed linen range is currently jumping off my North Indian handmade production line, albeit 6 months after the scheduled launch date. I am currently in the throws of automating a drop ship system out of South India. This entails establishing a secure warehousing area needing to comply with my auditing textile agency regulations, creating procedures with my courier agent that will integrate into my eCommerce site and training Indian staff in the correct handling of my high premium product. Creating a drop ship system from India answers another one of my aims of returning employment back into a developing country. I have always wanted to help make positive change at a grander scale but never wanted to just give handouts. Knowing that up to 35+ people are gainfully employed from this project is truly a humbling thought. I am also working on my social media presence amongst a long list of growing tasks as a new start-up. As my product launch coincides with the Christmas holidays, I am excited and daunted at the prospects of sales take off from my website. I am already looking at my next production and looking forward to connecting with more women artisan groups to make my products. Lack of ideas are not a problem for me, it’s a matter of anchoring them and adding the realistic value to see their fruition. I carry out a lot of online research, connect with people oversees and ask loads of questions. No doubt many people do get frustrated with me and my plethora of questions, but doing so stabilises my intentions and goals. At the moment, it’s rather hectic; there is a frenetic energy of jumping from one task to the next to keep the project on track and continually moving forward as I have to oversee my production in another country. Though just recently I can see that all the set up procedures are beginning to find their own niche and there is a subtle sense that events are settling down and where I can see one of my many aims of owning a ‘home based’ business can find its own balance. Though, as I need to travel to India to build upon my range, it’s at those times that the creative stress picks up again, as India is not the most relaxing country one could stop off at for long periods of time. Amidst the fun and creative opulence, the noise, smells, places and general way of life assaults the senses on a grand scale. One needs a holiday after visiting India. I often come back with the constant beep beep ringing in my ears for weeks afterwards. I have faced numerous challenges within Australia, starting with a lack of understanding from consumers about the value of buying ethical verses generic, a lack of support and direction from organic and fair trade bodies, and out of date data sent by them. As the majority of my physical work is carried out in India, there have also been escalating challenges that have affected my launch date such as monsoon season, unreliable so-called ethical vendors not delivering materials on time, religious festivals and cultural work methods not jellying. Sadly I’ve come to realise that a lot of the ethical agencies I wanted to align with do not communicate well with each other. Thus it has come to light that these socially responsible agencies are there purely from a marketing perspective. I’m now in the early stages of wanting to produce a documentary to expose the ethics behind the ethical agencies. I believe I have yet to fine tune my manufacturing alignments in India; until this date I have been on a massive research and discovery phase and have since met many contacts, good and bad. If anyone out there is wanting to set up an ethical apparel or home décor brand, I could certainly provide many leads. I believe in sharing contacts as it helps everyone in the process. This one took me a long time to take on – never be too proud to ask for help, even if you have to pay sometime to help you get out of hairy situation. Don’t money pinch on your budget too much either as you can’t foresee every scenario rolling out perfectly, no matter how much you have planned and evaluated. When processes feel as if they are against you or you want to give up because the project looks like a failure, keep plodding on – even if a task takes 3 days instead of the anticipated 3 hours. Answers can sometimes be found around the corner. When the chips are down, try not to verbally disperse your frustrations to others, except those that have created a start-up themselves or those that support you fully! People like to hear of others’ failures as they don’t want you to change. You need realistic encouragement only in these phases. What people/companies/organisations do you think are doing really cool stuff in your industry in Australia at the moment? There are a few ethical bed linen companies that are similar to my brand but not many stand out at this stage, as apparel grabs more of a focus than soft furnishing products. Australia has a long way to go with understanding the real value of buying ethically. The education really is only just warming up and it’s via the apparel industry. Australia already has rather expensive price tags on most items from food to textiles to white goods and home wares, but there seems to be no extra value in why they are so expensive compared to the ethical price tagged products. And until consumers learn the real meaning behind the make-up of any given product and those who make it, it’s difficult for ethical companies to stand out from the generics. HOWEVER, this new organic company does! There are some inspiring socially responsible platforms that are imparting sustainable/eco knowledge in upbeat ways that also point the focus towards new ethical companies wanting to be change makers, such as Otter. Also eCommerce sites that bring quality artisan products under the one ‘roof’ like Hard to Find. A stunning organic range of bed linen based on natures design principles is coyuchi. A major retailer wanting to become the world’s most sustainable player is Marks and Spencer. Initiating innovative ways to improve the quality of life locally, nationally and internationally. Promote business practices that respect people and the planet and a fairer trade for all. No, as I am busy engaging in supporting women artisan groups in India, I steer clear from over-administrated developed world charities and go straight to the source of developing world needs. It’s part of my business ethos; I’m pretty hands on and want to know the money goes straight to the source. I have never been any good at delegating, but one of the ideal ways I have found to gain industry exposure is to do pro-bono work. I did this very late in my career life within the production industry and I was up against whippersnappers half my age. As the younger generation is that much more IT savvy, I would be interested to hear from online marketers, social media gurus and eCommerce retailers who would like to help me propel this eCommerce business. I welcome a coffee chat with any person wanting to help fund and become involved with this project who is genuine about creating an ethical product and set in motion larger humanitarian programs, from seed to shelf within a developing country. I sold my house to fund my project as no funds were available for start-ups without a business history, as we are viewed too much of a liability. Why are there not enough government funding or private grants available to legitimate start-ups who have sound business plans? The great outdoor bar – enjoying a glass of Veuve Clicquot or soy latte upon a sea cliff top looking at a stunning view with my partner.